It makes sense to have knives within reach when preparing food - for example in a knife block or on a magnetic knife holder. The shape and material depend on the kitchen furniture, the space available and personal taste. All knife blocks and knife holders are made of high quality materials, easy to clean and durable. Knives need a wooden board as a cutting base to work properly. Why? When used on other materials the knife's blade gets blunt - for example on glass, ceramics or marble. High quality blades made from blade steel love wooden boards and thank you for it by keeping sharp for a long time. In addition, wood is more hygienic than plastic. 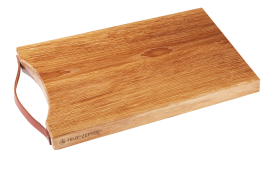 Only high quality tannic and thus anti-bacterial wood is used for FELIX cutting boards. Cutting board, solid walnut 16x12x1,5"
Cutting board, solid oak wood, 16x12x1,5"